This grand, celestial action of the planets, the sun, stars, moons; it is a concert of beauty and movement happening naturally with no force or effort. The idea of natural action is action in one’s life without forcing. Bruce talked frequently about the Tao, and a nice synonym for the Tao is nature or the natural world. Bruce Lee talked often about not being in opposition to nature. Our culture is mind-heavy. We are always trying to hack, force, speed up this natural action. Sometimes we can lose sight of our naturalness as human beings. Bruce Lee talked about willpower and being a self-willed man, which is about applying some force and effort into your journey. But this was in the context of naturalness, it is not just forcing your way through life. Natural action allows you to gather information to see what works and what does not, revealing a natural path to take towards your purpose. Bruce’s whole concept of being like water is about natural action, being in flow, flowing around obstacles. Natural Action, or Wu Wei, is described as non-action, but this does not mean no action. It is true that life’s circumstances can toss us around, we can get really mentally busy, and we can blindly engage without sensing the environment around us or without knowing who we really are. Let’s tune in more to our environment, and ourselves, and let those cues help guide us. Pay attention to what your body tells you. Our bodies are the number one indicator that we are not following natural action. The body will become tense and tight in response to unnatural pressure. Our world tells us to ignore what our body is telling us and/or tells us to overcome what our bodies are saying. For example, staying at a job that makes you sad or depressed because society says you need this particular job. Our minds will go through great lengths to rationalize and justify actions despite what our bodies tell us. Our bodies will initially give us feedback in subtle ways, but often we don’t listen until our body escalates to a more extreme reaction. Bruce Lee would talks a lot in his writings about the difference between the rational, thinking mind and the deep mind. The deep mind is the feeling mind that is in tune with the heart, the body, and the soul. It is the opposite of the calculating mind. Trust and listen to your intuition. Do not let your mind rationalize away a bad feeling. Try not to compartmentalize your life; this takes away from the naturalness of your life. Since we are human, we will want to have goals and make plans, to take action. The goal is to calibrate the naturalness with our efforts and actions. Bruce Lee ignites the feeling of a naturally occurring phenomenon, beautiful and in flow. But he was not always that way because he was a person. There were times where he would not listen to his natural way. Bruce was a growing and evolving human being, and wrote extensively about learning from mistakes, which means even Bruce Lee made mistakes. When Bruce was a kid living in Hong Kong he was getting into fights. He had this innate energy in him and he wanted to explore and push those boundaries. Bruce wanted to tap that energy and use it aggressively, but he had no direction, no container. He was getting into fights, people were getting hurt, and his teacher was sending him home from class. Bruce had to learn how to cultivate his energy and harness it. A good test is when we have a decision or a question, what is the feeling in our chest, in our heart? Is it a feeling of skipping towards that decision or answer with ease? Or do you feel that you are forcing yourself to march forward? From time to time, we do have to force ourselves to do things, such as getting out of bed in the morning, but if you are grounded in your life then you can still achieve flow throughout your day. When Bruce was in Hollywood, he had the goal of wanting to show the world the beauty of his culture and his art in a big way in Hollywood where it was not being done. This was a huge goal. He started it initially by being in the system, getting roles, writing treatments, trying to convince people to make his ideas, and doing everything he could to try to break Asians out of the stereotypical, racist portrayals. The natural state of Hollywood at the time was not going to allow Bruce to achieve this goal, so he had to find another way. Bruce had to find another, more natural route to his goal since all this efforting on his part was yielding nothing. So that is when he decided to go to Hong Kong where there were no barriers to an Asian actor being the lead actor. There, Bruce was able to write, direct, and star in his own projects. Bruce was able to execute his creativity and ideas in a place where it was more accepted, and was able to do it at such a high level because his ideas were good, and his artistry and mastery were superb. He took his learning’s from Hollywood, and implemented them in Hong Kong, creating his won production company. This is when Hollywood finally noticed Bruce Lee. 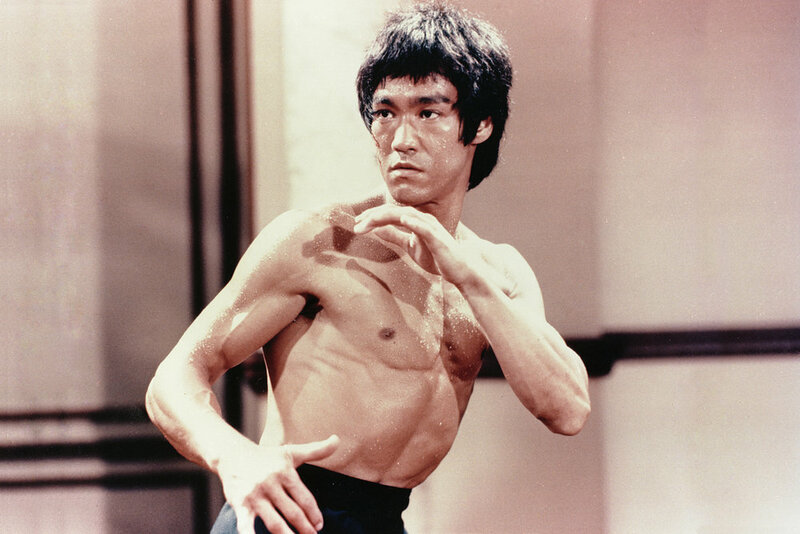 Bruce Lee’s natural action was always towards innovation and weaving east and west together. Bruce Lee was able to achieve so much so fast because he was so attuned to listen to his body and feelings. As soon as he started feeling that something was not right, he was able to shift and pivot. Many of us waste days, years, even our lives, not hearing and not shifting because we are in fear. We can exert our effort without using the effort to satisfy our ego. As you level up, you can let the past go as you move forward. In this way you can combine your will with nature. Where in life can you go with the grain more and follow the unfolding of things rather than force your way in opposition? Notice the times where your body feels like it is going into that controlled, tight feeling. When you notice that feeling take the opportunity to explore how you could experience that occasion by going with the grain. Don’t create problems where there aren’t problems, see what is there to be seen, accept it, incorporate it, and move through it. Start practicing being in your natural action. “I would like for you shout out Arnold Chon. Arnold Chon began his training at the age of 5 at the Jhoon Rhee Institute in Virginia. Arnold received his black belt at the age of 11 while training equally hard in gymnastics. Arnold became an Extreme Martial Arts competitor and conquered the competitive martial arts circuit, eventually becoming a NASKA champion and two time Junior Olympic gold medalist in Tae Kwon Do. After his rise in the competitive martial arts circuit, Arnold moved to Los Angeles to try his hand at Hollywood. Arnold got his chance to show the world what he could do in Mortal Kombat: Conquest. After this, Arnold began working on feature films like Big Mama's House, Epic Movie, and Wild Hogs. From fighting the best to training the best and sharing his knowledge from a lifetime in the Martial Arts. Arnold has trained MMA fighters to a championship level in his spare time, both in Bellator and the UFC. Arnold Chon continues to fight with Hollywood's toughest titans, recently taking on Sylvester Stallone and Arnold Schwarzenegger in Escape Plan. His more recent film credits as a stuntman include G.I. Joe: Retaliation and The Hangover Part III. Arnold also continues to frequently work in television, where it all started for him. Recently Arnold has done stunts for shows such as Sons of Anarchy, Criminal Minds, and Teen Wolf. Marshon thank you for nominating Arnold Chon, and Arnold you’re awesome! “Thanks Shannon, it's my great pleasure. I've been an immense admirer of your father from a very young age. To this day I can remember watching Enter the Dragon as a very young man and being amazed by his speed, athletic prowess and strength! It's really hard for me to capture in words but your father has been inspiration to me in so many ways, I've considered him as something of a mentor in my life even though I never knew him of course. I lost my mother at 12 and my father somewhat checked out as a parent at that time so I've spent my life looking for inspirational male role models that I've felt are able to hold both the masculine and feminine sides of themselves. And your father did that in such a powerful way, a way we may never see again, but I aspire to myself. He held the yin and the yang so beautifully. As a modern male in a time when I think many of us do not know how to hold ourselves as men, it's beyond inspirational to know that there was a man who could, on one hand, end a conflict with his fist but would rather end it with a poem, or a loving word, or a piece of philosophy that spoke to the heart of the issue and would end up doing a lot more healing than a punch could ever muster. So a word of thanks to YOU. I'm beyond grateful that you are keeping the purity of his legacy alive and kicking (get it?!) and I have the utmost respect for you and your process of fighting for that so we could all benefit from it. I've been a little late to the game in discovering the podcast but the silver lining has been that I can now "binge-listen" and absorb all the great gifts you've been offering through them.